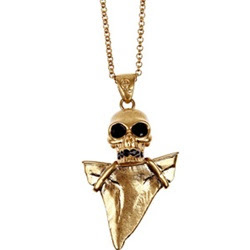 This skull and shark tooth pendant from Alexander McQueen retails for $460 at Saks. If you love the look, Sarah Aghili offers a wonderful option for a lot less cash. This version retails for only $16.50 and you can click HERE to view or purchase. Use code Look4Less to get 10% off your order.